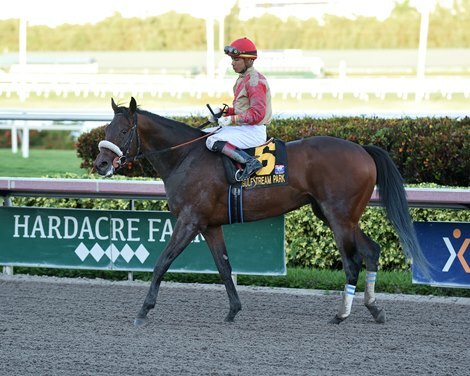 The following appeared on Booodhorse.com and is a preview of Saturday’s (Feb. 2) $350,000 Holy Bull Stakes (Gr. 2) at Gulfstream Park. Two other Derby preps are on tap Saturday — the $250,000 Withers (Gr. 3) at Aqueduct and the $150,000 Robert Lewis (Gr. 3)at Santa Anita. The Kentucky Derby is just three months away on Saturday May 4th. Santa Anita also has a Guaranteed Payout Saturday of their popular Rainbow 6 wager — the betting pool is expected to reach $10 Million! 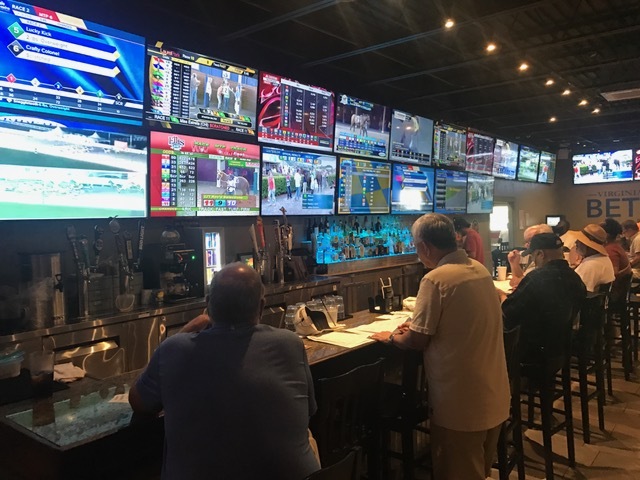 Enjoy all the action at a Virginia Bets OTB at Breakers Sports Grille (Henrico), Ponies & Pints (Richmond), The Windmill Sports Grill (Collinsville) and Buckets Bar & Grill (Chesapeake). Undefeated Remsen Stakes (G2) winner Maximus Mischief has trailed at only one point of call in three wins in as many starts. Mihos has surged past rivals in winning his past two starts, including a rally from fifth in the Jan. 5 Mucho Macho Man Stakes at Gulfstream Park. Perhaps those two different running styles will clash somewhere in the stretch of the $350,000 Fasig-Tipton Holy Bull Stakes (G2) Feb. 2 at Gulfstream, a 1 1/16-mile race that has attracted 10 3-year-olds. For Maximus Mischief, the Holy Bull will serve as his season opener after he completed a perfect 2018 with a dominating victory in the Remsen Stakes at Aqueduct Racetrack. Cash is King and LC Racing’s Maximus Mischief will cut back just a bit from the 1 1/8-mile Remsen, where he put away an early challenge from Tax to open a half-length lead through a half-mile, then showed competitiveness through the stretch in delivering a 2 1/4-length victory. The Remsen marked both the stakes debut and first race at two turns for Maximus Mischief, a son of Into Mischief —Reina Maria, by Songandaprayer. Trainer Robert “Butch” Reid Jr. likes the experience level the colt will bring into Saturday’s test. Mihos is one of ten entered ion the February 2nd Holy Bull Stakes. Maximus Mischief won his first two starts—a maiden and allowance at Parx Racing—by a combined 14 3/4 lengths. In preparation for his season debut, he has worked three times at Gulfstream this year, including a bullet move Jan. 19 in which he completed five furlongs in :58.02. Chuck Zacney’s Cash is King and Glenn Bennett’s LC Racing went to $340,000 at the 2018 Fasig-Tipton Midlantic 2-Year-Olds-in-Training Sale to land Maximus Mischief from the Cary Frommer consignment. In his second career try, Centennial Farms’ Mihos scored his maiden win going six furlongs Nov. 24 at Aqueduct. Trained by Jimmy Jerkens, the son of Cairo Prince made his 3-year-old debut Jan. 5 in the one-turn-mile Mucho Macho Man, where he rallied five wide into the stretch and sustained that rally to the wire, wearing down Trophy Chaser to prevail by a neck. Cairo Prince delivered the most spectacular race of his career in the 2014 Holy Bull, when he tracked three wide early before unleashing a powerful finish that produced a 5 3/4-length score. The Holy Bull is a Road to the Kentucky Derby race offering qualifying points to the top four finishers (10-4-2-1). 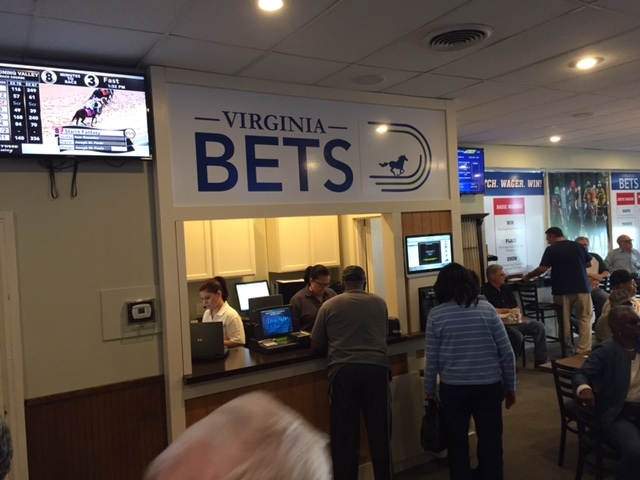 Racing fans can bet the three Derby preps at Breakers OTB at 9127 W. Broad Street in Henrico. While Maximus Mischief and Mihos already have secured stakes wins, the Holy Bull also could prove a coming-out party for one of several promising colts making their stakes debuts. Perhaps leading that list is Robert and Lawana Low’s Federal Case, who last year won a maiden race at Keeneland and an allowance test at Gulfstream. Federal Case is trained by Todd Pletcher, who won the 2012 Holy Bull with Algorithms and last year’s edition with Audible, who went on to take the Xpressbet Florida Derby (G1). Also making their stakes debuts in the Holy Bull are Harvey Wallbanger, who secured a maiden win in November at Churchill Downs; Come On Gerry, who in his second start posted a clear maiden win in December at Gulfstream; and maiden Going for Gold, who finished a close second in a pair of December starts at Laurel Park. Two-time stakes winner Garter and Tie will start from the rail after a close third in the Mucho Macho Man, and stakes winner Gladiator King will look to regroup after a pair of last-place efforts. Epic Dreamer will attempt to bounce back from an off-the-board finish in the Remington Springboard Mile Stakes, and experienced Everfast will go for his first stakes placing after three tries. 8 – Maximus Mischief (KY) – Jose L. Ortiz – 122 – Robert E. Reid, Jr.
10 – Going for Gold (KY) – Albin Jimenez – 116 – Robert B. Hess, Jr.